Apple is thought to be working with chipmaker Broadcom on a custom designed wireless charging system destined for the company's iPhone product line, though the silicon might not be ripe for inclusion in this year's "iPhone 8" model. J.P. Morgan analyst Harlan Sur in a research note published Friday says Apple and Broadcom have been developing the next-generation wireless charging solution for some two years, reports CNBC. Despite the significant incubation period, the team's charging technology might not be ready for a hotly anticipated iPhone refresh expected to debut this fall. In particular, Sur believes Apple might delay integration due to concerns related to the recent Samsung Galaxy Note 7 fiasco. Shortly after Samsung launched its Note 7 phablet in August of last year, users around the world began to report instances in which the device appeared to spontaneously catch fire. The problem worsened, prompting Samsung to halt shipments and issue a voluntary global recall of some 2.5 million units. Following news that replacement devices suffered from identical battery-related issues, the Korean company permanently discontinued the line in October. The kerfuffle, ultimately traced to a battery manufacturing flaw, was a major blow to Samsung's smartphone unit, driving a 96 percent decline in operating profits for the September quarter. Without Note 7 to buoy sales numbers, Samsung ceded its role as the world's largest smartphone vendor to Apple in the last quarter of 2016. With Samsung's Note 7 troubles as a backdrop, Apple is still looking to integrate a high-power wireless charging system that likely relies on lithium-ion power storage technology, Sur's note suggests. "We believe the glass back cover is conducive to wireless charging as it reduces signal interference versus a metal casing," Sur writes. "It is possible for Apple to add proprietary features such as fast charging or extended charging to differentiate itself from the pack and enhance the value of its own hardware ecosystem." The report is in line with predictions from well-connected KGI analyst Ming-Chi Kuo. Earlier this month, Kuo elaborated on a long-held belief that Apple plans to incorporate wireless charging into its upcoming "iPhone 8" handset, saying the handset's all-glass chassis will require use of a special graphite layer to dissipate resulting heat. Rumors earlier this year suggested Apple was working to deliver long distance wireless charging to iPhone in 2017, but later reports contradicted those claims, saying the company will instead opt for near field inductive charging system similar to that of Apple Watch. 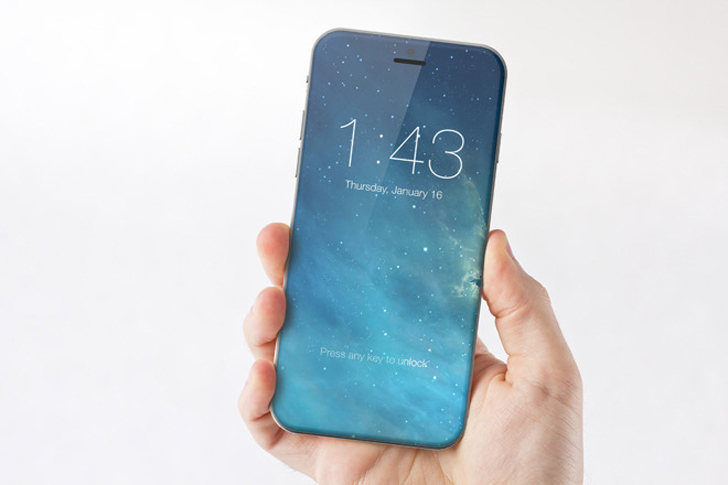 In any case, Apple is expected to release a next-generation "iPhone 8" handset later this year with some form of wireless charging technology. The flagship smartphone is widely rumored to include an OLED display, though panel size is still up for debate. Kuo this week said he anticipates Apple to use an edge-to-edge 5.8-inch OLED display, but dedicate a small strip at the bottom to a "function area" for virtual buttons and controls. That would leave an active screen area of 5.15 inches on the diagonal. Kuo also believes Apple intends to ditch the existing physical Touch ID home button for alternative bio-recognition hardware, specifically an optical fingerprint reader and facial recognition hardware.